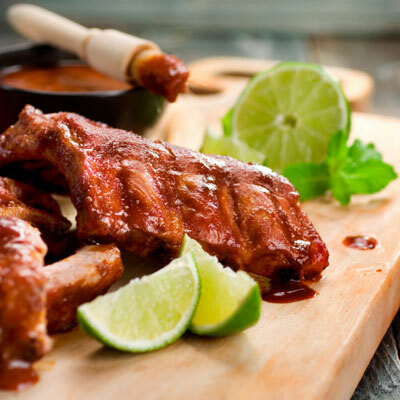 This extremely delicious baby-back ribs recipe is courtesy of Ivy Stark, the executive chef for the Dos Caminos restaurants in New York and Florida. It’s succulent ribs cooked Yucatan style: wrapped in banana leaves, covered with spices and orange juice, and baked. The flavor is complex and crave-inducing… these ribs can be kept for days, you’ll have them as excellent leftover. Yield: 24 (1/2 rack or 8-10 ounce) portions. Preparation time: 30 minutes plus unattended cooking time. Shelf life: 5 days. Banana leaves, available from Latin food suppliers. 1. Preheat oven to 350 degrees F. Arrange banana leaves in the bottom of a deep full-size baking pan large enough so the ribs will be completely covered. 2. In a bowl, combine thyme, oregano, rosemary, shallots, garlic, bay leaves, allspice, cumin, coriander and achiote paste. Lay ribs in the pan and distribute seasoning mixture evenly. Add lemons and limes, pour orange juice over the meat, cover pan with foil, seal tightly and bake for 1 1/2 hours. Remove, leave pan covered, and cool the ribs to room temperature. 3. Once cool, transfer ribs to sheet pans and refrigerate for up to 24 hours if not using right away. 4. Prepare the Spicy Cherry Glaze: in a medium-size skillet over medium heat, combine oil, garlic, onion, ginger and cherries and saute until lightly browned. Stir in tequila, hot sauce, sesame oil, sherry wine vinegar and soy sauce and simmer for 15 minutes; season with salt and pepper to taste. 5. Generously coat ribs with the glaze. Heat broiler and position the rack about 5 inches from the heat. Broil for 10 minutes to crisp the glaze; sprinkle on sesame seeds and serve immediately.